Chefman Crepe Maker Just $29.99! Down From $60! FREE Shipping! You are here: Home / Great Deals / Amazon Deals / Chefman Crepe Maker Just $29.99! Down From $60! FREE Shipping! Amazon has this Chefman Electric Crepe Maker on sale for just $29.99 down from $60 PLUS FREE shipping! Enjoy consistently easy and delicious breakfast using The Chefman Electric Griddle & Crepe Maker – every brunch lover’s dream. 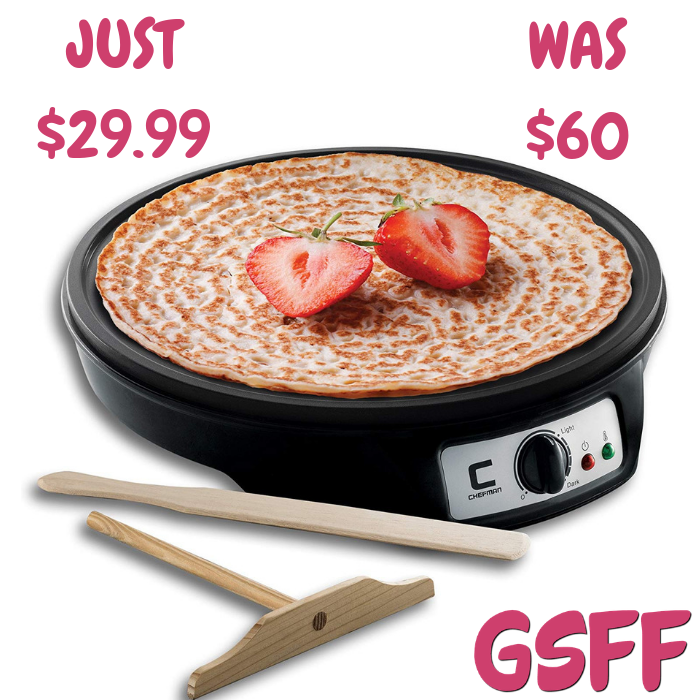 With multiple functionalities, you can make crepes, blintzes, pancakes, eggs, bacon, and many more breakfast delights! No more half-baked crepes or over-done pancakes. This crepe maker has a powerful 1200 Watt heating element that heats up your crepe pan quickly, while precise temperature knob makes it easy to make your breakfast exactly how you want it. Red light indicator lets you know when the crepe pan is on, while the green light indicates when the desired cooking temperature has been reached. With a large cooking area, it is easy to create restaurant-style crepes – your family and friends won’t believe it’s homemade. VERSATILITY: With the Chefman Electric Crepe Maker & Griddle you can quickly and easily make crepes, blintzes, pancakes, eggs, bacon and many more breakfast favorites! This multi-functional crepe pan also doubles as a griddle, so you can use it day or night. Breakfast, brunch, lunch or dinner will be easier and more fun than ever! PERFECTLY PRECISE: Powerful 1000 Watt heating element with a precise temperature control knob gives you consistently delicious & even results every time. Light up power feature indicates that your crepe maker is heating up, while green indicator light illuminates when it has reached desired cooking temperature. Includes free wooden batter spreader and spatula for perfect distribution & easy crepe creation. CONVENIENT: Large cooking area makes it easy to create restaurant style crepes. Simply preheat the crepe maker, spread a thin layer of batter, and watch your crepe cook in seconds. Use the included wooden batter spreader and spatula for perfect distribution. EASY CLEAN: Non-stick aluminum surface cleans as easily as it cooks; food will sliced off with ease! Simply wipe the cooking plate over with a damp cloth and your crepe machine is clean. Always make sure the appliance is cool and dry before storing.